Of these two quotes, it’s hard to decide whether the very delicious, “There will also be 100kg of cheese available to the judges.” or the very British, “Judge severely but do not be ungenerous.” stuck out more, but whatever the case, they summarize a great deal about how it is to judge the Decanter World Wine Awards. Last week, I was one of the 219 judges tackling 17,200 wines from all over the world that were sent to London to be reviewed by what are some of the most knowledgeable people in the wine industry. The sheer weight of everything in this previous sentence is need of a bit of unpacking, so let’s look at just what goes in to making these awards happen. The awards have continued yearly and have become such a significant part of the magazine that they actually have year-round staff dedicated to managing them, above and beyond the fleet of people they hire to manage all the wines during the week. It’s important to keep in mind that 17,200 is just the number of the individual label entries. The wineries needs to send in four bottles of each wine, thus making the organizers need to keep track of nearly 70,000 bottles in total. The awards take place over five days. There are number of judges who stay all five days and then others that only taste for a few of the days as many people have a great many demands on their time, especially at this point in spring. The time demands especially true for the sommeliers who are often judging during the day to then go work a shift at their restaurant that evening. Needless to say, coffee is given in ready supply in the judge’s restaurant. When signing up to judge, you check off your area(s) of expertise. For those who are at advanced levels of knowledge such as Masters of Wine or Master Sommeliers, they will often bounce around many regions to stay abreast of what’s being produced. How often does one get to taste wines of China, Kazakhstan, or even Serbia after all? Others will often hone in just one or two such as Stephen Skelton MW who focuses on the British wines. For myself, I chose Spain, Croatia, & Georgia and ended up on mostly Spain with a bit of Central Europe. For the actual judging, you’re set up at round tables with four people a table. There are generally quite disparate backgrounds to the people you’re tasting with, but there is always one head of the table working to channel it. You’re poured a flight of wines that’s usually around 10 or so each time and everyone tastes through them individually, recording scores via iPads with a proprietary web interface of Decanter’s design. Once everyone has finished the wines, the head of the table reviews the scores, sees if there is general agreement and if not, the wine is re-tasted by the group and discussed until a conclusion is reached. If you’re in to wine, this is actually quite fascinating. It’s generally the case that one of three scenarios arise: everyone is in very close agreement, the table is split, or then there is one outlier with a score far above or below the other three. In the instances where there isn’t a consensus, everyone has to defend their point of view on the wine and then the head of the table will make the ultimate call based upon this. If the consensus can’t be reached, a regional chair is called over to break the tie. If a wine is deemed to have a Gold, it is then re-tasted by an additional expert panel to make a final call. They will also taste other wines and sometimes raise or lower the scores. It make seem like an enviable job to kick it at the back of the room sampling the best wines of the world all day long but given how much wine quality has and continues to improve, the amount of Golds increase more each year and these chairs have a massive amount of work each day. Like most of the wine world, the judging uses the 100 point system but something of a stricter Decanter interpretation which is to say that it isn’t as generous as The Wine Advocate. Some judges can be downright stingy in awarding higher scores, thus the “do not be ungenerous” quote above. 98+ is Exceptional Gold, 95-97 is Gold, 90-94 is Silver, 86-89 is Bronze, 83-85 is Commended. Anything below 83 is simply, “out”. Throughout the tasting and the various flights I was on throughout the days, we did indeed find wines that covered all these ranges. The “out” wines were unfortunate as even though we would request a replacement bottle to see if it was a wine or a bottle problem, it would usually be the wine and I don’t know why someone went to all the trouble and expense to send in a wine that was clearly faulty. Most everyone I judged with really didn’t want to give such low scores as it can make you feel like you’re being snobbish, but if the wine required it, we did. 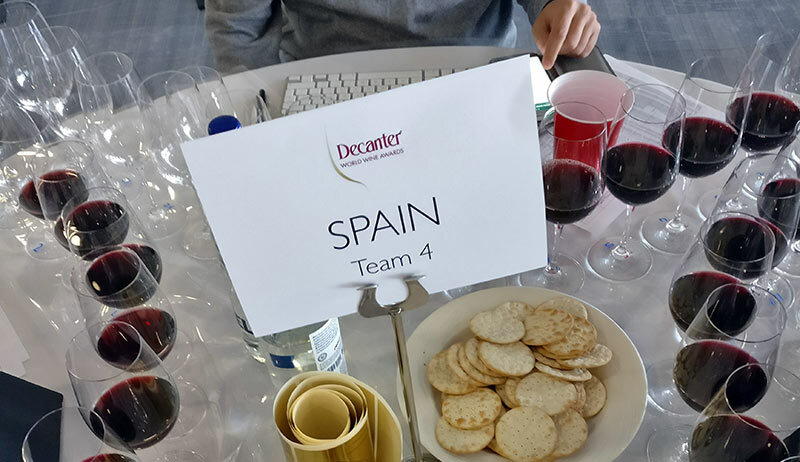 While I’ve been judging wines for years in Spain, I went in to this competition admittedly a bit nervous as honestly, the level of wine judging in Spain is simply not at the same level in the UK. Tied in to this, the awards pluck out people from various parts of the world who are often the best in their countries so it’s really the crème de la crème. Anyone sensible and not full of themselves should rightly wonder how they’ll stack up. Ultimately, if you’ve studied wine heavily, you do as fine as everyone else. Sometimes in a flight, you’re the one scoring higher or lower than the rest of the group and then on others, it’s someone else. The amazing thing is that this is irrespective of someone’s experience in wine and it greatly relates to personal reactions to specific wines. Taste as they say, is subjective. There was maybe only one wine that I truly didn’t agree with a call on, but at the same time, there were others were someone else at the table was in that position. The beauty of the judges selected for the awards is that it is unlike when you have a group of people and everyone will sink to the lowest common denominator in terms of ability. In wine, people will strive to be better than everyone else and this competitive spirit makes everyone at the table try harder. If you try to coast through a flight, you will quickly find that everyone else has done far better analysis and you need to step up your game the next time. I won’t lie, the concentration is intense and I went to bed very early every night of the judging. In regards to tasting, I always feel that you can never taste enough wines or stop learning about tasting. It is a bottomless pit of study and no matter how much you do it or how many books you read, there’s always more to learn. Even a Master of Wine needs to keep up with things that change in the world of wine. So, in addition to making for a lively judging session, I think that most people come away from the judging having explored their tasting abilities more. The awards get fully announced in about a month and until then I can’t speak as to any of the results specifically but after tasting about 350 wines over three days, there were endless surprises to be found and tasting with such qualified people helped hone my own tasting even more. 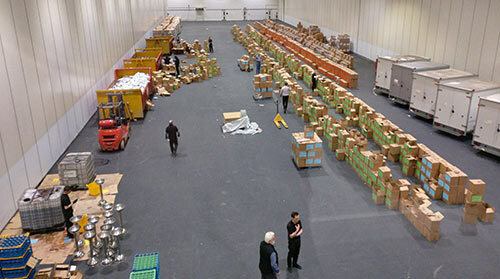 I’m still pretty tired after the intensity of last week, but I can’t even imagine the effort that it took to coordinate these 17,000+ wines and then deal with sorting the bottles that remained. And then of course there’s compiling all of the information in the end after an intense week of making sure 200 people got a tasty lunch and had plenty of palate-cleansing water and dry biscuits. Would I do it again? In a heartbeat as it was an excellent experience. The only real problem in this is that it will be very hard to return to judging other competitions that aren’t run at a level such as this. It certainly is the most exhausting, and most satisfying, of any competition I have judged on. Good seeing you last week – over the delicious mini cup cakes! This is some pretty heady stuff. Only 218 other experts and you at this prestigious competition. I think you have made the leap to the elite in the world of wine. Congratulations. Hey gran Miquel! And another Evening-Night de les Carinyenes in Porrera just after this 5 day tasting experience! Hope you’ve had some days of palate relax by now. Thank you! Really interesting to read your judging story about how this competition works. Can’t decide it I want to put a wine in competition or if I want to make it a goal to judge there. Nice to know anyway that it is a well run competition! Make no mistake, it’s very much a profitable venture for Decanter, but it is indeed done in a professional and correct manner. I’ve encountered many others who charge a good deal as well but are done in a sloppy way. This is the best write-up I’ve seen of the process yet, I really enjoyed reading it! I’m definitely interested in judging myself one day and this has reinforced my desire to do so. Now I also see why you were so exhausted; that’s an awful lot of tasting! Nicely done.